You are a strong. You are smart. And you are valued. Female empowerment isn’t a fleeting fad, it’s a way of life. An ideology that signifies an ongoing evolution of equality. And at Nelle & Lizzy, it defines us. This is why we’ve designed the Empowerment Collection - a selection of wearables that are more than just a fashion, they’re an inspiration. With words of motivation, encouragement, and the power of positivity, we can all promote self-worth, independence, and a fiery spirit that drives women to achieve their goals. 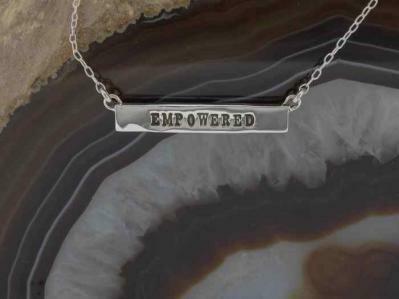 The Empowered bar necklace is a great reminder for any woman/girl to tap into that which makes her so strong and special. If you add a birthstone it takes the place of one letter. There are various stamping options to choose from. Made of sterling silver. Stones are 2mm Swarovski crystals. 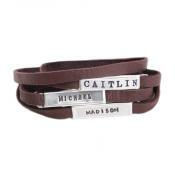 Our custom stamped Empowerment Bar Necklace is a simple statement of the strength of the wearer. 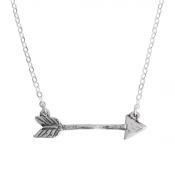 Our simple and elegant nameplate bar necklace is made for everyday wear in sterling silver. Add your own word of encouragement. Our silver bar necklace is uniquely designed in our studio and is a nice thickness without being too heavy for daily wear. If you want to add a bit of color, feel free to add a stone! Dimensions: All silver is sterling. Silver stamped bar is approx. 1" x 1/4". Stones are 2mm Swarovski crystals. Personalized Stamp: empowered, strength, power, unstoppable, sisu, fierce, or use your creativity to do create a silver nameplate necklace that is meaningful to you! 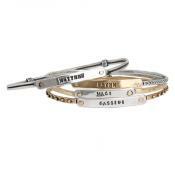 Customize the stamped silver bar with your choice of Nelle Font (max 11 characters) or Block Font (max 9 characters). If you add a birthstone, it takes the place of one letter.